Have a look at the Hana Hou Menu! 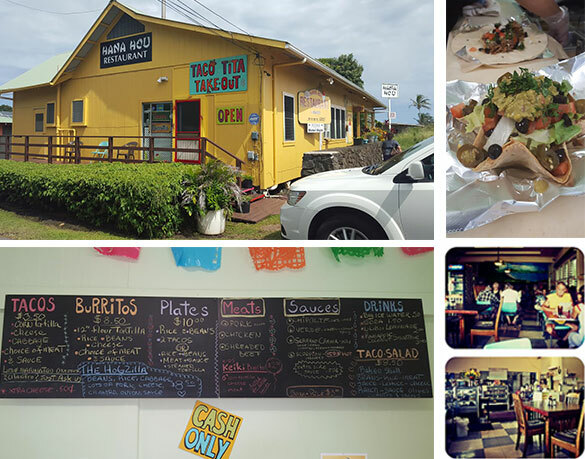 Since 1940, Hana Hou Restaurant has been offering tasty, homemade comfort food and desserts, with signature dishes that you won’t find anywhere else! Call us today for take-out or rent one of our motel rooms and enjoy our local diner. We welcome gluten-free and vegetarian guests! For one of the best dining experiences on the Big Island, you can’t pass up an opportunity to grab a bite at Hana Hou Restaurant! Whether you’re in the mood for one of our grab-and-go sandwiches or you’re ready to sit down and feast on some good old-fashioned comfort food, we’ve got just the menu for you. Try one of our signature entrées like the Loco Moco or Hogzilla Burrito, or opt for one of our mouth watering gluten free or vegetarian dishes, like our amazing vegetarian stir fry. We guarantee that no matter what you choose to dine on, your taste buds will be delighted! Our establishment supports both dine-in and carry out meal options. We serve a number of signature dishes that are known island-wide! Our menu accommodates gluten free and vegetarian diners. We are a member of the Kau Chamber of Commerce. We serve only the freshest fish and finest grass fed beef in Naalehu, HI.